The Portrush man was devastated after his opening 75, believing he hadn’t got the game to conquer Augusta National and win the Masters. But as McIlroy imploded over the weekend and lost the will to fight with rounds of 77 and 76 to finish tied for 40th alongside Tiger Woods on five over, McDowell played his last 54 holes in five under to notch a career best finish of 12th on two under. Delighted with his finish and believing he can indeed win the Masters some day, McDowell did his best Arnold Arnold Schwarzenegger/Terminator impression at the finish. “Like Arnold said, I’ll be back,” McDowell said with a grin. “I’m looking forward to many more Augustas, many more Masters championships. I’d love to put that green jacket on my back. “But that was another couple of rounds towards achieving that goal sometime. This golf course isn’t the perfect setup for me, but as the golf course got faster and firmer this week, all of a sudden I started to see my way around it. McIlroy got off to a horror start for the second day running, three-putting the first from 30 feet when he ran his birdie effort 10 feet past. He then failed to birdie the par-five second from six feet and bogeyed the fifth when he went right off the tee and flew through the back of the green. Another shot went when he drove into trees at the seventh and while he birdied the ninth to turn in two over, he suffered another meltdown at the start of the back nine. Twelve months ago he dropped six shots at the 10th, 11th and 12th to throw the Masters away. This time his head was already down as he bogeyed the 10th and double bogeyed the 11th. The 22-year old’s body language was poor all day and he obviously wished he were back at his Florida base instead of grinding it out on a course that demands the utmost from his game, especially on and around the greens. He slipped to six over for the day 14th when he his approach spun back off the front of the green and while he birdied the 15th and 18th, he left Augusta on a massive low. Speaking in a low monotone afterwards, McIlroy said: “I played poorly yesterday and it was hard to get myself up for today. I wanted to go out and shoot a good score but didn’t have my best golf today. “It’s a disappointing week after starting out so well. That’s golf. It can change overnight. You can feel comfortable one day and come out the next day and not feel so comfortable. “I actually felt I played okay today but was a couple of yards off here and there and around this golf course it can make pretty good shots seem pretty average. “I was going out to try and shoot as good a score as I could but never got going. I was more uncomfortable off the tee than I have been. I struggled to hit the draw as well I usually do and maybe I could have worked on it a little bit more. “I am just going to take a couple of weeks off and practice hard. Everything feels pretty good and on any other golf course I would have been in the mix. You just have to be on your game around this course and I wasn’t this weekend. “It was one of those things. I played pretty well over the first couple of days and then I came out on Saturday and just didn’t have it. “Shooting 42 on the front nine killed me for the rest of the tournament but I’ll come back next year and do my best again. 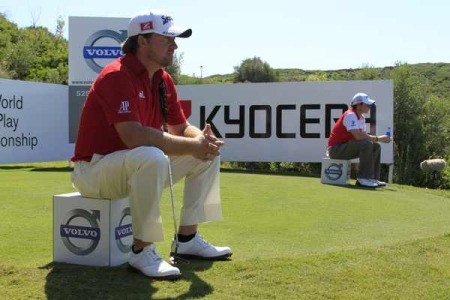 McIlroy could learn a lot from McDowell, who gave him a lesson in how to persevere when all is lost. With victory out of the question, McIlroy appeared to have no interest in fighting back against adversity. 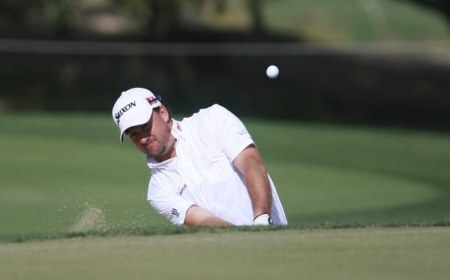 yet while he started the final round a shot better than McDowell on one-over par, he finished seven shots ahead of him. McDowell was one over par after six holes, sandwiching a birdie at the second between bogeys at the first and sixth. But he finished with five birdies in his last 10 - the seventh, eighth, 12th, 15th and 16th - to remind himself that he can win a Masters title in the future. “I guess it probably reminds me that I need to be more patient with myself,” McDowell said. “I came off the golf course here on Thursday and I probably could have done with ten minutes just to try and let the steam, the fog clear because I just bogeyed the last couple holes. “I had played so negatively, and that frustrates me. That frustrates me when I play that negative because I don’t give myself a chance to play. I had no chance with the attitude that I had that day. “You know, I guess I get disappointed with myself more when my attitude is wrong, so I reset that attitude and came out on Friday, Saturday and Sunday and was a little bit better. Nice to play better on the days when I’m on, and nice to finish with a career low 68 here at Augusta. As for McIlroy, McDowell reckoned his pal lost all interest after that 77 on Saturday but backed him to return to Augusta National and win in the near future. G-Mac said: “Rory is not used to kind of being out of contention. It’s been six months when the guy is never out of the top five, and I’m sure he had the wind knocked out of his sails yesterday. “I’m sure he had high hopes this weekend. It’s a hard game when the adrenaline leaves the body, when the desire to perform leaves the body, it’s interesting how the score can just escalate.